As President Trump prepares for his address next week to a joint session of Congress, Republicans say they are more inclined to trust the president, rather than GOP congressional leaders, if the two sides disagree. For their part, Democrats are far more concerned that congressional Democrats will not do enough, rather than go too far, to oppose Trump. In disputes with Congress, Republicans would trust Trump. About half of Republicans and Republican-leaning independents (52%) say that if Trump and Republican congressional leaders disagree on an issue, they would be more likely to trust Trump. 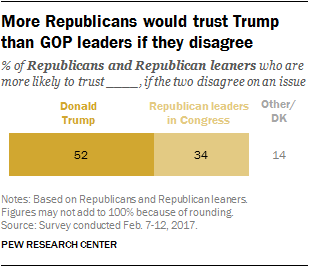 About a third (34%) say they would trust GOP leaders if they have a disagreement with the president. Democrats want their party to challenge Trump. Nearly three-quarters of Democrats and Democratic leaners (72%) say their bigger concern is that congressional Democrats will not do enough to oppose Trump and his policies. Just 20% say they are more concerned that Democrats in Congress will go too far opposing Trump and his policies. 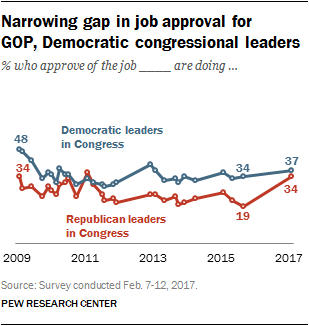 GOP leaders’ job approval improves. Job approval for Republican congressional leaders has increased sharply – from 19% to 34% – since September 2015. In contrast, there has been little change in Democratic leaders’ job ratings (34% then, 37% now). 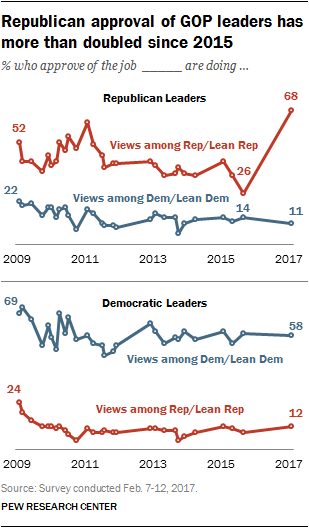 The rise in approval of GOP leaders is largely attributable to a turnaround among Republicans: 68% approve of GOP leaders’ performance now; only 26% did so two years ago. Low favorability for congressional leaders. None of the four top congressional leaders – Republicans Mitch McConnell and Paul Ryan, Democrats Chuck Schumer and Nancy Pelosi – is viewed particularly favorably. The shares offering no opinion of each leader are relatively high, particularly Schumer, the new Senate Democratic leader (36% no opinion). For most of the past six years Republicans have given GOP leaders in Congress relatively low approval ratings. Republicans have controlled the House since 2010 and took control of the Senate in 2014. In September 2015, a tumultuous period during which former House Speaker John Boehner resigned, just 26% of Republicans and Republican leaners approved of the job GOP leaders were doing. Today, with Republicans in full control of Congress, as well as the White House, 68% of Republicans and Republican leaners approve of their job performance. Democrats’ views of their party’s leaders have shown less change over this period. Currently, 58% of Democrats and Democratic leaners approve of their job performance. In September 2015, 59% of Democrats gave the party’s leaders positive approval ratings. 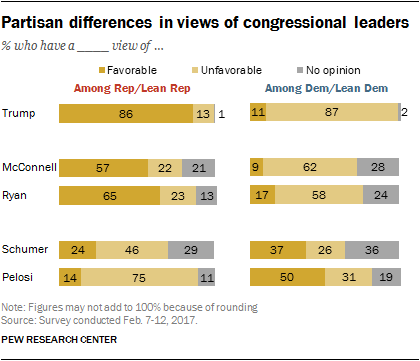 When it comes to favorability ratings for congressional leaders, none is viewed more favorably than unfavorably. As in the past, favorability ratings for Mitch McConnell and Nancy Pelosi are more negative than positive. Only 27% view McConnell favorably, while 45% view him unfavorably; about a quarter (28%) have no opinion of the Senate Majority leader. A third view Pelosi favorably, while 49% view her unfavorably and 18% have no opinion. The public has mixed views of Paul Ryan (36% favorable, 43% unfavorable, 21% no opinion). These views are little changed from October 2012, when Ryan was running for vice president as Mitt Romney’s running mate. 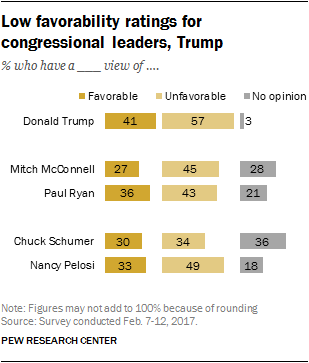 Opinions of Chuck Schumer also are mixed; Schumer is not as well-known as other congressional leaders (30% favorable, 34% unfavorable, 36% no opinion). In contrast to congressional leaders, nearly all Americans have an opinion of Donald Trump. As reported on Feb. 16, 41% of the public has a favorable opinion of Trump, while 57% view him unfavorably. Partisans’ views of individual congressional leaders are deeply divided. Republicans and Republican leaners have much more favorable views of Senate Majority Leader Mitch McConnell and Speaker of the House Paul Ryan than do Democrats and Democratic leaners, and the reverse is true for Minority Leaders Chuck Schumer and Nancy Pelosi. Schumer is not very well known, even among Democrats: 37% view him favorably, 26% unfavorably, while 36% have no opinion. Meanwhile, John McCain has high favorability ratings among members of both political parties. 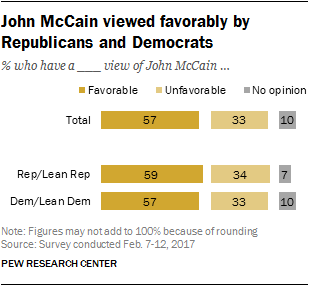 Currently, 57% of Americans view McCain favorably, while 33% view him unfavorably. Nearly identical shares of Republicans (59%) and Democrats (57%) view McCain favorably. Opinions of McCain among Republicans are virtually unchanged from September 2013, when 56% of Republicans and Republican leaners viewed him favorably. However, favorable opinions of him among Democrats have increased 19 percentage points since then (38% then, 57% today). On balance, Republican and Republican leaners are more likely to side with Donald Trump over Republican leaders if there is a disagreement between them on an issue. About half (52%) say they would be more likely to trust Donald Trump, while only about a third (34%) say they would be more likely to trust Republican leaders in Congress. Younger Republicans (those under 40) are the only subgroup of Republicans who say they are more inclined to trust Republican congressional leaders over Trump in the case of a disagreement between them. Just 36% of Republicans under 40 say they would be more likely to trust Trump in this scenario, while 52% say they would more likely to trust Republican leaders. Majorities of older Republicans say they would be more likely to trust Trump. 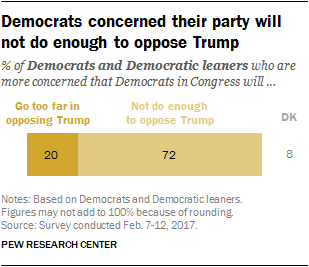 Democrats and Democratic leaners are much more concerned that their representatives in Congress will not do enough to oppose Donald Trump and his policies than they are that congressional Democrats will go too far in their opposition (72% vs. 20%). There are modest differences in these views across subgroups of Democrats: Large majorities of liberal Democrats (77%) and conservative and moderate Democrats (68%) both say their bigger concern is that Democrats in Congress will not do enough to oppose Trump’s policies.